Present at the awarding of the International Association of Business Communicators were (from left) GMA Network Corporate Affairs Head and IABC Executive Vice President Carmencita Arce, Globe Telecom CSR Program Head and IABC Director Jeffrey Tarayao, GMA Kapuso Foundation Executive Vice-President Mel Tiangco, and TV5 Public Service Head of News and Current Affairs and IABC Director Sheryl Yao. GMA Kapuso Foundation Executive Vice-President Mel Tiangco was recently honored by the International Association of Business Communicators (IABC), one of the biggest professional networks worldwide. The talk show host and news anchor received the Communication Excellence in Organizations or the CEO Excel Award for her exemplary efforts in helming the Kapuso Foundation. Conferred annually by IABC Philippines, the CEO Excel Award is given to senior executives who have effectively used communication strategies and tools to advance the goals of their organizations. In a press conference for the Kapuso Foundation held last April 6 at the Old Spaghetti House in Sgt. Esguerra, Mel Tiangco told the members of the press: "Sometimes it doesn’t take much to make an impact on the life of your fellowmen. All you need is to make an effort." During a roundtable discussion, the talk show host shared with the press her first brush with public service. She narrated how she was so touched by the beauty and the raw culture of the Mangyans from Oriental Mindoro when she was asked to build a school for the tribe years ago. The project required her to endure long treks up the mountains and push on despite the stormy weather, she said. But despite the hardships, the news anchor said that the experience was the "turning point of her career." 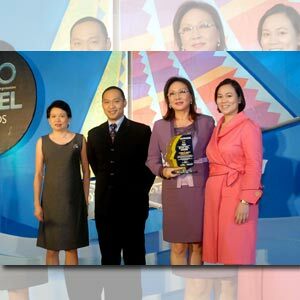 Her more than two decades in media allowed Mel Tiangco to receive a number of awards to date, all recognizing her continued and commendable involvement in News and Public Affairs. NEVER LURED BY POLITICS. In the same presscon, a member of the press asked Mel Tiangco if she has ever entertained thoughts of venturing into politics. The news anchor was quick to dismiss it and said that she has never considered running for office. On working for the Kapuso Foundation, she said: "It is my vocation. It is a calling." STAYING FIT AND HEALTHY. When asked how many days she works, Mel Tiangco rapidly answered, "Eight days!" Staying fit and healthy is part of her lifestyle, she pointed out. She has her own gym at her home where she works out at least an hour a day. When it comes to food, she prefers to eat fish, and opts for clean and healthy living. "But I’m not as fit as you think I am," she told PEP. The newscaster has had a heart attack in 1989 and has already undergone two angioplasties. To relax, Mel Tiangco said she always goes for a massage. The multi-awarded news anchor also mentioned that she loves to travel with her grandchildren, citing England as her favorite country to date.